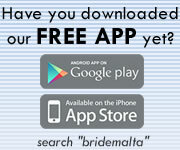 Join the BrideMalta.com Mailing List. It is FREE to register... simply click here and follow the instructions! Get your BrideMalta VIP Discount Card: It brings you exclusive discounts from some of the best local vendors. To view current discounts click here. Arrange meetings with priest / minister / registrar to discuss wedding plans and set a tentative date. Set a budget. Open a joint account to start saving. Start compiling a guest list. Consider the services of a wedding planner or organiser. Click here for more information. Book the church or civil wedding venue. To view a list of available churches click here. To view a list of available venues click here. Discuss possible caterers, and book accordingly. To view a list of available caterers, click here. Additionally you might also have to consider beverages and also bars & cocktails. Decide on reception venue and visit the ones you like most. Consider tents in outdoor venues. To choose a venue click here. To choose a tent click here. The bride needs to start thinking about the wedding gown and which style suits her best. For more details click here. Book any vendor you heart is set on. For a list of all vendors, click here. If you are holding an engagement party set the date and send invitations. Will you have guests coming from abroad? Send a Save The Date card. If your guests need also accommodation click here. Book flowers and/or balloons for decorating the Church, reception and also the bride's and groom's parents' house. If you are planning to preserve your bouquet discuss this with your florist. For more details click here. Book the photographer (click here) and videographer (click here). Decide on the music you would like to have at the church and during the reception, such as a band, pianist, a solo singer, etc. For more information click here. Buy or hire your wedding gown, veil & accessories including bridesmaids and flower girls. For a list of bridal shops click here. For a list of jewellery shops for accessories to complement the wedding gown and the bridal party click here. Hire the suit/tux for the groom and groomsmen. A list of vendors can be found here. Help your parents choose their attire. For a list of evening wear shops click here. Decide on the bridal car or "karozzin" you like, and on the additional cars for the bridal party and groomsmen. For a complete list click here. Additionally you might also need to book extra transportation for other guests, including foreigners who might not wish to drive, and also grandparents. Start planning your honeymoon and make necessary reservations. For more information click here. Do not forget any legality required, like entry visa and passports. If you are travelling outside Europe check whether you need any inoculations. Purchase any travel insurance as soon as reservations are made. Would you like your wedding to be a bit different? Click here for a list of the latest novelties to make your wedding extra special and unique. Choose your wedding invitations. You might also decide to add thank you cards or personalised tags. For more information click here. Decide if you would like to buy or make your wedding souvenirs. For a list of vendors selling souvenirs (and items which you might use to make your own souvenirs) click here. Decide on the hairdresser, make-up artist, nail technician. Don't forget to book also for the bridal party and your parents. Sometimes even the witnesses and family members would like to join in this event. For a list of vendors click here. Decide if you would like to have a wedding list. For more information click here. Book any rental equipment such as chairs, tables, tents, etc. For more information click here. Choose the wedding rings and the engraving. For a list of vendors click here. Go to the marriage registry and ensure you have all necessary documentation for your marriage licence. Consider the possibility of having a red carpet outside the church and also the reception. For more details click here. Confirm the food menu with the caterer and the beverages necessary for the reception. Buy all shoes and accessories for the bride and groom, and the bridal party. Buy any special lingerie in time for the final fittings of the gown. Take dance lessons if you want to do a particular dance routine or want to feel more confident for your first dance. Have a medical and dental check-up. Book your wedding hair and makeup trial. Confirm bookings for honeymoon. Don't forget to check passports. Send any invitations to any guests living abroad. Arrange a second meeting with the priest, and/or registrar to discuss the service and agree a date for the publication of the banns. Select music for ceremony and reception to ensure you have the songs YOU want at your wedding. Plan your going away outfits. Some couples might decide to end the reception in their wedding gowns. Book and additional alcoholic and non-alcoholic beverages that will not be included by your caterers. Request the publication of banns at the Marriage Registry and at the Curia. Get your marriage license from the public registry. For more information click here. Finalise guest list. Send the invitations to the foreign guests. Confirm dates for bridal showers and bachelorette parties. Take note of any changes such as surname and addresses that you would need to apply for. Finalise the necessary transportation for your wedding day. List your music playlist and must have photos. Get you marriage licence and other necessary paperwork in hand. Practice your first dance wearing your shoes. Book first night in a hotel and confirm details for honeymoon. To choose first-night accommodation click here. Reconfirm all prior bookings & contracts. Select presents for attendants, bridal party and groomsmen. Collect wedding dress, bridal party dresses, suits/tux, wedding rings and other accessories. Confirm the final number of guests and finalise the menu with your caterer. Confirm seating plan if having a sit down meal. Make sure that everyone involved in the wedding knows their role. Send the invitations to local guests. Confirm address details and timings with the wedding car hire company. Shop for appetisers and drinks for guests visiting you in the next couple of weeks. Pack for honeymoon. Order foreign currency if necessary. Collect honeymoon tickets and confirm you have all the necessary documents. Ensure groom, father and best man have finalised their speeches, if applicable. Confirm any remaining contracts. Prepare all necessary payments to the vendors. Leave a copy of your honeymoon itinerary with a relative in case of emergencies. Make a timeline for your wedding day and notify all parties involved. Pick up your wedding dress and accessories. Ensure any final fitting for both males and females of the wedding party. Rehearse ceremony with wedding party, officiant and planner/organiser. Prepare all wedding outfits to avoid creases. Prepare all payments in separate well labelled envelopes for vendors. Try to find a quiet moment to exchange gifts with your partner. Pack the emergency kit and other requested items and hand over to bestman. Confirm the delivery of drinks with venue handing list to bestman. Give the guest book and pen and any other items for the reception to bestman. Have a foamy bath, sipping a glass of your favourite wine while you soak. Relax and have an early night. Have a good breakfast to start off the day. Wear a wide neck top for hair and makeup appointments. Advice the best man/wedding planner to check all preparations at the church and reception are as planned. Do not let anyone rush you while getting ready. Remember this is YOUR DAY so enjoy it!!!! Return all hired clothes and decorations. Write to banks and other official bodies if you are changing your surname. Contact your insurance agency about naming your partner as beneficiary on your life and car insurance. You can decide to preserve the wedding bouquet. Discuss this with your florist. Will you clean your gown? If you are considering gown cleaning click here. Set up Home and Decorate it. If you are considering to decorate your home, or parts of it, check our Home & Lifestyle section by clicking here. Note: All vendors listed on BrideMalta.com offer services in Malta. If you are getting married in Gozo, click here to see the vendors that also offer their services in Gozo. Disclaimer/Footer: Should you think that we have forgotten something please feel free to contact us on info@bridemalta.com.